NEW YORK - Juliana Luchkiw, one of the four suspects arrested amid the investigation into the death of actor Philip Seymour Hoffman, has been released on her own recognizance, reports CBS New York. The 22-year-old appeared before a judge Thursday morning. A second suspect, Max Rosenblum, also 22, is still waiting to be granted bail. Police arrested Luchkiw and Rosenblum along with jazz musician Robert Vineberg, 57, and Thomas Cushman, 48, at a lower Manhattan apartment Tuesday night after police received a tip that Hoffman may have bought his heroin at that location. Officials said police found about 350 packets of heroin in one of the two apartments searched in the building. Hoffman, 46, was found dead Sunday in his Manhattan apartment with a syringe sticking out of his arm. More than 50 small plastic envelopes of heroin were discovered in his apartment. Although autopsy results are still pending, authorities suspect the Oscar winner overdosed on heroin. Some of the packets found in Hoffman's apartment were variously stamped with the ace of hearts and others with the ace of spades. Those found in the building where the arrests occurred had different brand names, including Black List and Panda, officials said. Police are analyzing the heroin confiscated in the building to see if there is a match or similarity to the heroin found at Hoffman’s apartment, a law enforcement source told CBS News. 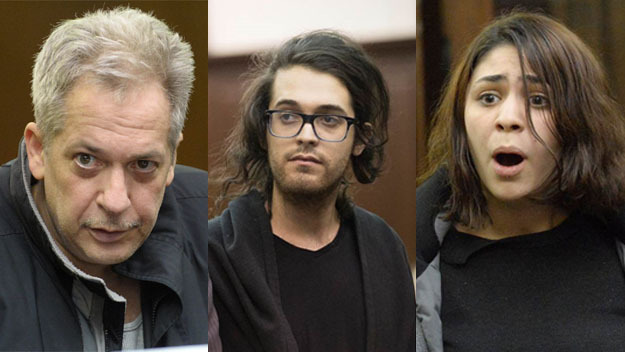 Lawyers for the four suspects arrested vigorously deny their clients had any role in Hoffman’s death and have suggested they were being swept up in a maelstrom of attention surrounding the actor’s demise, according to CBS New York. However, CBS News confirmed Wednesday that at least one of the four drug suspects arrested had the actor's cellphone number. Three of the four suspects -- Vineberg, Rosenblum and Luchkiw -- were arraigned Wednesday. Vineberg is charged with felony heroin possession with an intent to sell. Rosenblum and Luchkiw are charged with misdemeanor cocaine possession. All three were initially ordered held without bail. The fourth suspect, Cushman, was not immediately arraigned. Luchkiw and Rosenbaum were found to be in possession of two bags of cocaine at the time of their arrest, a criminal complaint alleges, according to CBS New York. Meanwhile, authorities say about 300 packets of heroin, a bag of cocaine and about $1,200 in cash was found in Vineberg’s apartment. Investigators have determined Hoffman made six ATM transactions for a total of $1,200 inside a supermarket near his home the day before his death, law enforcement officials have said.